From an early age, Stan handled and operated with wood. Growing up, he spent countless hours by his father’s side, aiding him in his custom woodworking business, Wood Craftsmen. Throughout his high school years, Stan honed his knowledge and skills in Cabinetmaking classes. He participated in the Cabinetmaking Skills USA Competition, taking home first place for the state of Tennessee in both 2009 and 2010. He won fourth place in the Skills USA Nationals. After graduation, Stan devoted his full time to working with his dad in the family business. Many years of experience staining and finishing kitchens and cabinets led Stan in 2011 to take a Wood touch-up and Repair Workshop through Mohawk. He learned the most up to date touch-up and repair techniques for wood offered in the industry. 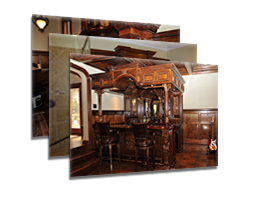 In 2012 Wood Craftsmen decided to pursue the process of restoration and refinishing alongside their manufacture and construction of new furniture and cabinets. The Furniture Doctor was created. Stan currently overseas this line of the business and travels to many homes refinishing kitchens and cabinets. Many unique, heirloom pieces of furniture have been brought in for restoration.